When a person doesn’t understand something, he feels internal discord: however he doesn’t search for that discord in himself, as he should, but searches outside of himself. Thence a war develops with that which he doesn’t understand. 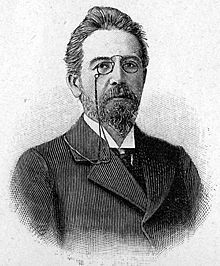 Anton Pavlovich Chekhov (Анто́н Па́влович Че́хов) (29 January 1860 – 15 July 1904) (Old Style: 17 January 1860 – 2 July 1904) was a major Russian short story writer and playwright. It’s not a matter of old or new forms; a person writes without thinking about any forms, he writes because it flows freely from his soul. He who doesn’t know how to be a servant should never be allowed to be a master; the interests of public life are alien to anyone who is unable to enjoy others’ successes, and such a person should never be entrusted with public affairs. That can not possibly be, because it could never possibly be. Eyes—the head’s chief of police. They watch and make mental notes. A blind person is like a city abandoned by the authorities. On sad days they cry. In these carefree times they weep only from tender emotions. We live not in order to eat, but in order not to know what we feel like eating. Better a debauched canary than a pious wolf. If only one tooth aches, rejoice that not all of them ache.... If your wife betrays you, be glad that she betrayed only you and not the nation. Love is a scandal of the personal sort. By nature servile, people attempt at first glance to find signs of good breeding in the appearance of those who occupy more exalted stations. Watching a woman make Russian pancakes, you might think that she was calling on the spirits or extracting from the batter the philosopher’s stone. A fiancé is neither this nor that: he’s left one shore, but not yet reached the other. Only during hard times do people come to understand how difficult it is to be master of their feelings and thoughts. I myself smoke, but my wife asked me to speak today on the harmfulness of tobacco, so what can I do? If it’s tobacco, then let it be tobacco. The thirst for powerful sensations takes the upper hand both over fear and over compassion for the grief of others. Probably nature itself gave man the ability to lie so that in difficult and tense moments he could protect his nest, just as do the vixen and wild duck. It is depressing to hear the unfortunate or dying man jest. [Ognev] recalled endless, heated, purely Russian arguments, when the wranglers, spraying spittle and banging their fists on the table, fail to understand yet interrupt one another, themselves not even noticing it, contradict themselves with every phrase, change the subject, then, having argued for two or three hours, begin to laugh. Not everyone knows when to be silent and when to go. It not infrequently happens that even diplomatic persons of good worldly breeding fail to observe that their presence is arousing a feeling akin to hatred in their exhausted or busy host, and that this feeling is being concealed with an effort and disguised with a lie. Each of us is full of too many wheels, screws and valves to permit us to judge one another on a first impression or by two or three external signs. Country acquaintances are charming only in the country and only in the summer. In the city in winter they lose half of their appeal. One can prove or refute anything at all with words. Soon people will perfect language technology to such an extent that they’ll be proving with mathematical precision that twice two is seven. You look at any poetic creature: muslin, ether, demigoddess, millions of delights; then you look into the soul and find the most ordinary crocodile! If you can’t distinguish people from lap-dogs, you shouldn’t undertake philanthropic work. Everyone has the same God; only people differ. It is not only the prisoners who grow coarse and hardened from corporeal punishment, but those as well who perpetrate the act or are present to witness it. There is something beautiful, touching and poetic when one person loves more than the other, and the other is indifferent. To regard one’s immortality as an exchange of matter is as strange as predicting the future of a violin case once the expensive violin it held has broken and lost its worth. It’s even pleasant to be sick when you know that there are people who await your recovery as they might await a holiday. There is nothing more awful, insulting, and depressing than banality. Pesotsky had an immense house with columns and lions, off which the stucco was peeling, and with a footman in swallow-tails at the entrance. The old park, laid out in the English style, gloomy and severe, stretched for almost three-quarters of a mile to the river, and there ended in a steep, precipitous clay bank, where pines grew with bare roots that looked like shaggy paws; the water shone below with an unfriendly gleam, and the peewits flew up with a plaintive cry, and there one always felt that one must sit down and write a ballad. Death can only be profitable: there’s no need to eat, drink, pay taxes, offend people, and since a person lies in a grave for hundreds or thousands of years, if you count it up the profit turns out to be enormous. Moscow is a city that has much suffering ahead of it. By poeticizing love, we imagine in those we love virtues that they often do not possess; this then becomes the source of constant mistakes and constant distress. Good breeding doesn't mean that you won't spill sauce on the tablecloth, but that you won't notice when someone else does. It seems to me that all of the evil in life comes from idleness, boredom, and psychic emptiness, but all of that is inevitable when you become accustomed to living at others’ expense. Exquisite nature, daydreams, and music say one thing, real life another. All of life and human relations have become so incomprehensibly complex that, when you think about it, it becomes terrifying and your heart stands still. Who keeps the tavern and serves up the drinks? The peasant. Who squanders and drinks up money belonging to the peasant commune, the school, the church? The peasant. Who would steal from his neighbor, commit arson, and falsely denounce another for a bottle of vodka? The peasant. While you’re playing cards with a regular guy or having a bite to eat with him, he seems a peaceable, good-humoured and not entirely dense person. But just begin a conversation with him about something inedible, politics or science, for instance, and he ends up in a deadend or starts in on such an obtuse and base philosophy that you can only wave your hand and leave. There are no small number of people in this world who, solitary by nature, always try to go back into their shell like a hermit crab or a snail. People who live alone always have something on their minds that they would willingly share. It is uncomfortable to ask condemned people about their sentences just as it is awkward to ask wealthy people why they need so much money, why they use their wealth so poorly, and why they don’t just get rid of it when they recognize that it is the cause of their unhappiness. Nature’s law says that the strong must prevent the weak from living, but only in a newspaper article or textbook can this be packaged into a comprehensible thought. In the soup of everyday life, in the mixture of minutia from which human relations are woven, it is not a law. It is a logical incongruity when both strong and weak fall victim to their mutual relations, unconsciously subservient to some unknown guiding power that stands outside of life, irrelevant to man. If you really think about it, everything is wonderful in this world, everything except for our thoughts and deeds when we forget about the loftier goals of existence, about our human dignity. Dear, sweet, unforgettable childhood! Why does this irrevocable time, forever departed, seem brighter, more festive and richer than it actually was? Мысль и красота, подобно урагану и волнам, не должны знать привычных, определенных форм. If in the first act you have hung a pistol on the wall, then in the following one it should be fired. Otherwise don't put it there." Ilia Gurliand Reminiscences of A. P. Chekhov, in Teatr i iskusstvo 1904, No 28, 11 July, p. 521. commonly known as Chekhov's dictum or Chekhov's gun. That which we experience when we are in love is perhaps our normal state. Being in love shows a person who they should be. Mankind has conceived history as a series of battles; hitherto it has considered fighting as the main thing in life. The desire to serve the common good must without fail be a requisite of the soul, a necessity for personal happiness; if it issues not from there, but from theoretical or other considerations, it is not at all the same thing. Solomon made a great mistake when he asked for wisdom. Ordinary hypocrites pretend to be doves; political and literary hypocrites pretend to be eagles. But don't be disconcerted by their aquiline appearance. They are not eagles, but rats or dogs. It always seems to the brothers and the father that their brother or son didn't marry the right person. Love is a great thing. It is not by chance that in all times and practically among all cultured peoples love in the general sense and the love of a man for his wife are both called love. If love is often cruel or destructive, the reason lies not in love itself, but in the inequality between people. A nice man would feel ashamed even before a dog. How pleasant it is to respect people! When I see books, I am not concerned with how the authors loved or played cards; I see only their marvelous works. Какое наслаждение уважать людей! Когда я вижу книги, мне нет дела до того, как авторы любили, играли в карты, я вижу только их изумительные дела. I observed that after marriage people cease to be curious. The more refined the more unhappy. Alernate translation: The more cultured a man, the less fortunate he is. Love, friendship, respect, do not unite people as much as a common hatred for something. Alternate translation: Nothing better forges a bond of love, friendship or respect than common hatred toward something. It is easier to ask of the poor than of the rich. Death is terrible, but still more terrible is the feeling that you might live for ever and never die. They say: "In the long run truth will triumph;" but it is untrue. Better to perish from fools than to accept praises from them. If you are afraid of loneliness, do not marry. Although you may tell lies, people will believe you, if only you speak with authority. As I shall lie in the grave alone, so in fact I live alone. Our self-esteem and conceit are European, but our culture and actions are Asiatic. Man will only become better when you make him see what he is like. Alternate translation: Man will become better when you show him what he is like. How intolerable people are sometimes who are happy and successful in everything. When one longs for a drink, it seems as though one could drink a whole ocean—that is faith; but when one begins to drink, one can only drink altogether two glasses—that is science. If you wish women to love you, be original; I know a man who used to wear felt boots summer and winter, and women fell in love with him. We fret ourselves to reform life, in order that posterity may be happy, and posterity will say as usual: "In the past it used to be better, the present is worse than the past." Alternate translation: We go to great pains to alter life for the happiness of our descendants and our descendants will say as usual: things used to be so much better, life today is worse than it used to be. Мы хлопочем, чтобы изменить жизнь, чтобы потомки были счастливы, а потомки скажут по обыкновению: прежде лучше было, теперешняя жизнь хуже прежней. Nothing lulls and inebriates like money; when you have a lot, the world seems a better place than it actually is. Ничто так не усыпляет и не опьяняет, как деньги; когда их много, то мир кажется лучше, чем он есть. There is not a single criterion which can serve as the measure of the non-existent, of the non-human. Alternate translation: Not one of our mortal gauges is suitable for evaluating non-existence, for making judgments about that which is not a person. Ни одна наша смертная мерка не годится для суждения о небытии, о том, что не есть человек. And I thought that were we now to obtain political liberty, of which we talk so much, while engaged in biting one another, we should not know what to do with it, we should waste it in accusing one another in the newspapers of being spies and money-grubbers, we should frighten society with the assurance that we have neither men, nor science, nor literature, nothing! Nothing! It is unfortunate that we try to solve the simplest questions cleverly, and therefore make them unusually complicated. We should seek a simple solution. There is no Monday which will not give its place to Tuesday. Do you know when you may concede your insignificance? Before God or, perhaps, before the intellect, beauty, or nature, but not before people. Among people, one must be conscious of one’s dignity. Isolation in creative work is an onerous thing. Better to have negative criticism than nothing at all. When in a serious mood, it seems to me that those people are illogical who feel an aversion toward death. As far as I can see, life consists exclusively of horrors, unpleasantnesses and banalities, now merging, now alternating. To describe drunkenness for the colorful vocabulary is rather cynical. There is nothing easier than to capitalize on drunkards. Despite your best efforts, you could not invent a better police force for literature than criticism and the author’s own conscience. I was so drunk the whole time that I took bottles for girls and girls for bottles. Writers are as jealous as pigeons. In Western Europe people perish from the congestion and stifling closeness, but with us it is from the spaciousness.... The expanses are so great that the little man hasn’t the resources to orient himself.... This is what I think about Russian suicides. Happiness does not await us all. One needn’t be a prophet to say that there will be more grief and pain than serenity and money. That is why we must hang on to one another. Tsars and slaves, the intelligent and the obtuse, publicans and pharisees all have an identical legal and moral right to honor the memory of the deceased as they see fit, without regard for anyone else’s opinion and without the fear of hindering one another. Hypocrisy is a revolting, psychopathic state. One must speak about serious things seriously. I feel more confident and more satisfied when I reflect that I have two professions and not one. Medicine is my lawful wife and literature is my mistress. When I get tired of one I spend the night with the other. Though it's disorderly it's not so dull, and besides, neither really loses anything, through my infidelity. I don’t know why one can’t chase two rabbits at the same time, even in the literal sense of those words. If you have the hounds, go ahead and pursue. The more simply we look at ticklish questions, the more placid will be our lives and relationships. I would like to be a free artist and nothing else, and I regret God has not given me the strength to be one. Pharisaism, obtuseness and tyranny reign not only in the homes of merchants and in jails; I see it in science, in literature, and among youth. I consider any emblem or label a prejudice.... My holy of holies is the human body, health, intellect, talent, inspiration, love and the most absolute of freedoms, the freedom from force and falsity in whatever forms they might appear. There should be more sincerity and heart in human relations, more silence and simplicity in our interactions. Be rude when you’re angry, laugh when something is funny, and answer when you’re asked. A tree is beautiful, but what’s more, it has a right to life; like water, the sun and the stars, it is essential. Life on earth is inconceivable without trees. Forests create climate, climate influences peoples’ character, and so on and so forth. There can be neither civilization nor happiness if forests crash down under the axe, if the climate is harsh and severe, if people are also harsh and severe.... What a terrible future! An artist must pass judgment only on what he understands; his range is limited as that of any other specialist—that's what I keep repeating and insisting upon. Anyone who says that the artist's field is all answers and no questions has never done any writing or had any dealings with imagery. An artist observes, selects, guesses and synthesizes. It is a poor thing for the writer to take on that which he doesn’t understand. You are right to demand that an artist engage his work consciously, but you confuse two different things: solving the problem and correctly posing the question. I have in my head a whole army of people pleading to be let out and awaiting my commands. I don’t care for success. The ideas sitting in my head are annoyed by, and envious of, that which I’ve already written. We learn about life not from pluses alone, but from minuses as well. It doesn’t matter that your painting is small. Kopecks are also small, but when a lot are put together they make a ruble. Each painting displayed in a gallery and each good book that makes it into a library, no matter how small they may be, serve a great cause: accretion of the national wealth. Children are holy and pure. Even those of bandits and crocodiles belong among the angels.... They must not be turned into a plaything of one’s mood, first to be tenderly kissed, then rabidly stomped at. Of course politics is an interesting and engrossing thing. It offers no immutable laws, nearly always prevaricates, but as far as blather and sharpening the mind go, it provides inexhaustible material. In one-act pieces there should be only rubbish—that is their strength. Narrative prose is a legal wife, while drama is a posturing, boisterous, cheeky and wearisome mistress. Everything is good in due measure and strong sensations know not measure. Lermontov died at age twenty-eight and wrote more than have you and I put together. Talent is recognizable not only by quality, but also by the quantity it yields. Everyone judges plays as if they were very easy to write. They don’t know that it is hard to write a good play, and twice as hard and tortuous to write a bad one. When performing an autopsy, even the most inveterate spiritualist would have to question where the soul is. Life is difficult for those who have the daring to first set out on an unknown road. The avant-garde always has a bad time of it. Without a knowledge of languages you feel as if you don’t have a passport. Wherever there is degeneration and apathy, there also is sexual perversion, cold depravity, miscarriage, premature old age, grumbling youth, there is a decline in the arts, indifference to science, and injustice in all its forms. In general, Russia suffers from a frightening poverty in the sphere of facts and a frightening wealth of all types of arguments. There are no lower or higher or median moralities. There is only one morality, and it is precisely the one that was given to us during the time of Jesus Christ and that stops me, you and Barantsevich from stealing, offending others, lying etc. I divide all literary works into two categories: Those I like and those I don’t like. No other criterion exists for me. One can only call that youth healthful which refuses to be reconciled to old ways and which, foolishly or shrewdly, combats the old. This is nature’s charge and all progress hinges upon it. The world is a fine place. The only thing wrong with it is us. How little justice and humility there is in us, how poorly we understand patriotism! I think that it would be less difficult to live eternally than to be deprived of sleep throughout life. One had better not rush, otherwise dung comes out rather than creative work. All great sages are as despotic as generals, and as ungracious and indelicate as generals, because they are confident of their impunity. He who constantly swims in the ocean loves dry land. We old bachelors smell like dogs, do we? So be it. But I must take issue with your claim that doctors who treat female illnesses are womanizers and cynics at heart. Gynecologists deal with savage prose the likes of which you have never dreamed of. Satiation, like any state of vitality, always contains a degree of impudence, and that impudence emerges first and foremost when the sated man instructs the hungry one. Can words such as Orthodox, Jew, or Catholic really express some sort of exclusive personal virtues or merits? An expansive life, one not constrained by four walls, requires as well an expansive pocket. When we retreat to the country, we are hiding not from people, but from our pride, which, in the city and among people, operates unfairly and immoderately. People understand God as the expression of the most lofty morality. Maybe He needs only perfect people. The wealthy man is not he who has money, but he who has the means to live in the luxurious state of early spring. There is nothing more vapid than a philistine petty bourgeois existence with its farthings, victuals, vacuous conversations, and useless conventional virtue. Despicable means used to achieve laudable goals render the goals themselves despicable. The more elevated a culture, the richer its language. The number of words and their combinations depends directly on a sum of conceptions and ideas; without the latter there can be no understandings, no definitions, and, as a result, no reason to enrich a language. The person who wants nothing, hopes for nothing, and fears nothing can never be an artist. Whoever sincerely believes that elevated and distant goals are as little use to man as a cow, that “all of our problems” come from such goals, is left to eat, drink, sleep, or, when he gets sick of that, to run up to a chest and smash his forehead on its corner. When you live on cash, you understand the limits of the world around which you navigate each day. Credit leads into a desert with invisible boundaries. It’s easier to write about Socrates than about a young woman or a cook. The air of one’s native country is the most healthy air. I would love to meet a philosopher like Nietzsche on a train or boat and to talk with him all night. Incidentally, I don’t consider his philosophy long-lived. It is not so much persuasive as full of bravura. I can’t accept “our nervous age,” since mankind has been nervous during every age. Whoever fears nervousness should turn into a sturgeon or smelt; if a sturgeon makes a stupid mistake, it can only be one: to end up on a hook, and then in a pan in a pastry shell. Sports are positively essential. It is healthy to engage in sports, they are beautiful and liberal, liberal in the sense that nothing serves quite as well to integrate social classes, etc., than street or public games. By all means I will be married if you wish it. But on these conditions: everything must be as it has been hitherto—that is, she must live in Moscow while I live in the country, and I will come and see her. ... I promise to be an excellent husband, but give me a wife who, like the moon, will not appear every day in my sky. The bourgeoisie loves so-called “positive” types and novels with happy endings since they lull one into thinking that it is fine to simultaneously acquire capital and maintain one’s innocence, to be a beast and still be happy. A man who doesn’t drink is not, in my opinion, fully a man. It’s worth living abroad to study up on genteel and delicate manners. The maid smiles continuously; she smiles like a duchess on a stage, while at the same time it is clear from her face that she is exhausted from overwork. Tell mother that however dogs and samovars might behave themselves, winter comes after summer, old age after youth, and misfortune follows happiness (or the other way around). A person can not be healthy and cheerful throughout life. Losses lie waiting and man can not safeguard against death, even if he be Alexander of Macedonia. One must be prepared for anything and consider everything to be inevitably essential, as sad as that may be. When a person expends the least amount of motion on one action, that is grace. I have no faith in our hypocritical, false, hysterical, uneducated and lazy intelligentsia when they suffer and complain: their oppression comes from within. I believe in individual people. I see salvation in discrete individuals, intellectuals and peasants, strewn hither and yon throughout Russia. They have the strength, although there are few of them. Women writers should write a lot if they want to write. Take the English women, for example. What amazing workers. Is it our job to judge? The gendarme, policemen and bureaucrats have been especially prepared by fate for that job. Our job is to write, and only to write. There are plenty of good people, but only a very, very few are precise and disciplined. You ask “What is life?” That is the same as asking “What is a carrot?” A carrot is a carrot and we know nothing more. Instructing in cures, therapists always recommend that “each case be individualized.” If this advice is followed, one becomes persuaded that those means recommended in textbooks as the best, means perfectly appropriate for the template case, turn out to be completely unsuitable in individual cases. When a person hasn’t in him that which is higher and stronger than all external influences, it is enough for him to catch a good cold in order to lose his equilibrium and begin to see an owl in every bird, to hear a dog’s bark in every sound. The wealthy are always surrounded by hangers-on; science and art are as well. If I were asked to chose between execution and life in prison I would, of course, chose the latter. It’s better to live somehow than not at all. Capital punishment kills immediately, whereas lifetime imprisonment does so slowly. Which executioner is more humane? The one who kills you in a few minutes, or the one who wrests your life from you in the course of many years? The government is not God. It does not have the right to take away that which it can’t return even if it wants to. • Any result divided by infinity gives nothing. I’m in mourning for my life. Great Jove angry is no longer Jove. I try to catch every sentence, every word you and I say, and quickly lock all these sentences and words away in my literary storehouse because they might come in handy. Do you remember you shot a seagull? A man came by chance, saw it and destroyed it, just to pass the time. Как легко, доктор, быть философом на бумаге и как это трудно на деле! Translation: How easy it is, Doctor, to be a philosopher on paper, and how hard it is in life! People should be beautiful in every way—in their faces, in the way they dress, in their thoughts and in their innermost selves. In countries where there is a mild climate, less effort is expended on the struggle with nature and man is kinder and more gentle. Ah, but ignorance is better. At least then there's hope. A woman can only become a man’s friend in three stages: first, she’s an agreeable acquaintance, then a mistress, and only after that a friend. Who but a stupid barbarian could burn so much beauty in his stove and destroy that which he cannot make? Those who come a hundred or two hundred years after us will despise us for having lived our lives so stupidly and tastelessly. Perhaps they’ll find a means to be happy. At the door of every happy person there should be a man with a hammer whose knock would serve as a constant reminder of the existence of unfortunate people. It has become customary to say that a man needs only six feet of land. But a corpse needs six feet, not a person. Принято говорить, что человеку нужно только три аршина земли. Но ведь три аршина нужны трупу, а не человеку. Деньги, как водка, делают человека чудаком. А вы знаете, кто хоть раз в жизни поймал ерша или видел осенью перелётных дроздов, как они в ясные, прохладные дни носятся стаями над деревней, тот уже не городской житель, и его до самой смерти будет потягивать на волю. "Grigory Petrovitch, let us weep, let us weep with joy!" he said in a thin voice, and then at once burst out laughing in a loud bass guffaw. "Ho-ho-ho! This is a fine daughter-in-law for you too! Everything is in its place in her; all runs smoothly, no creaking, the mechanism works well, lots of screws in it." "Crutch is coming! Crutch! The old horseradish." "Yes, that's how it is, child. He who works, he who is patient is the superior." "Why did you marry me into this family, mother?" said Lipa. "One has to be married, daughter. It was not us who ordained it." "Why do I love him so much, mamma? Why do I feel so sorry for him?" she went on in a quivering voice, and her eyes glistened with tears. "Who is he? What is he like? As light as a little feather, as a little crumb, but I love him; I love him like a real person. Here he can do nothing, he can't talk, and yet I know what he wants with his little eyes." Somewhere far away a bittern cried, a hollow, melancholy sound like a cow shut up in a barn. The cry of that mysterious bird was heard every spring, but no one knew what it was like or where it lived. At the top of the hill by the hospital, in the bushes close to the pond, and in the fields the nightingales were trilling. The cuckoo kept reckoning someone's years and losing count and beginning again. In the pond the frogs called angrily to one another, straining themselves to bursting, and one could even make out the words: "That's what you are! That's what you are!" What a noise there was! It seemed as though all these creatures were singing and shouting so that no one might sleep on that spring night, so that all, even the angry frogs, might appreciate and enjoy every minute: life is given only once. In two or three hundred years life on earth will be unimaginably beautiful, astounding. Man needs such a life and if it hasn’t yet appeared, he should begin to anticipate it, wait for it, dream about it, prepare for it. To achieve this, he has to see and know more than did his grandfather and father. What seems to us serious, significant and important will, in future times, be forgotten or won’t seem important at all. To Moscow, to Moscow, to Moscow! After us they’ll fly in hot air balloons, coat styles will change, perhaps they’ll discover a sixth sense and cultivate it, but life will remain the same, a hard life full of secrets, but happy. And a thousand years from now man will still be sighing, “Oh! Life is so hard!” and will still, like now, be afraid of death and not want to die. If there's any illness for which people offer many remedies, you may be sure that particular illness is incurable, I think. To a heart transformed by love, it is a mandolin. All Russia is our orchard. The cherry orchard is now mine!... I bought the estate on which my grandfather and father were slaves, where they were not even permitted in the kitchen. I do love Chekhov dearly. I fail, however, to rationalize my feeling for him: I can easily do so in regard to the greater artist, Tolstoy, with the flash of this or that unforgettable passage […], but when I imagine Chekhov with the same detachment all I can make out is a medley of dreadful prosaisms, ready-made epithets, repetitions, doctors, unconvincing vamps, and so forth; yet it is his works which I would take on a trip to another planet. This great kindness pervades Chekhov's literary work, but it is not a matter of program, or of literary message with him, but simply the natural coloration of his talent. No author has created with less emphasis such pathetic characters as Chekhov has. All the same, I can't stand your plays. Shakespeare wrote badly, and you're even worse! А все-таки пьес ваших я терпеть не могу. Шекспир скверно писал, а вы еще хуже! What writers influenced me as a young man? Chekhov! As a dramatist? Chekhov! As a story writer? Chekhov! This page was last edited on 30 January 2019, at 13:43.